Got some of your own you want to share? Post them in the “Files” section of the Facebook group ! 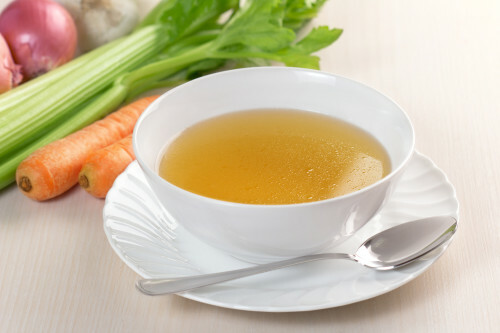 Chop the leek, carrot, parsnip, celery and onion to approximately the same size. Wash the herbs. Put all the ingredients and water into a large heavy-bottomed pan. Bring to the boil and let it simmer lightly on a low heat with a lid on the pan for 20 to 25 minutes. Pour the liquid through a sieve into a bowl. At this point you can season with salt and use it for a recipe, or let the liquid cool in order to pour it into an ice-cube tray to keep for convenient future use. This is a basic stock version. To change the taste you can add for example, fennel, juniper berries, thyme, garlic, celeriac, cloves or any vegetable and herb that takes your fancy or fits to the dish you are making the stock for. A little hint: Lovage, also known as love parsley, is a very useful plant that is often used as a component in soups. It is more commonly used in southern Europe. It is hard to find in supermarkets in the northern regions, but you can ask at the grocery market or in a garden centre if they can help you get one. The flavour of the plant is reminiscent of soup seasoning. Give it a try if you can get a hold of it. Celery leaves can be found in the middle of a celery stalk. These are still young, tender and have a lot of flavour. For the pasta bring some water with a little salt to the boil and drop in the pasta of choice. Stir right away, to stop the pasta from sticking to each other. Cook according to package instructions or until just tender (al dente). 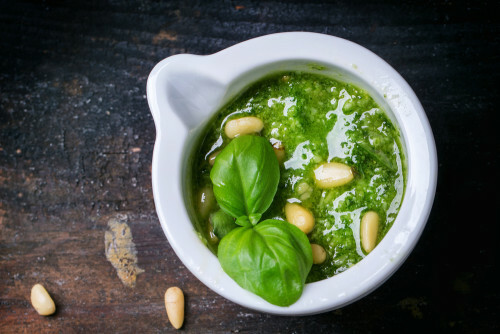 While your pasta is cooking put the basil, parsley, celery leaves, nuts or seeds of choice, mozzarella and olive oil and a pinch of salt in a blender and blend until smooth. Heat the vegetable stock in some water and stir in a little butter, then add the herb mixture from the blender. Keep on the lowest possible heat while waiting for the pasta to cook. Drain the pasta, and combine with the Genovese sauce. Ready.